A teenage girl gets a shot of HPV vaccine, which protects against a virus that causes cervical cancer. When it comes to getting the HPV vaccine to protect against cervical cancer, teens below the poverty line are doing better than the rest. 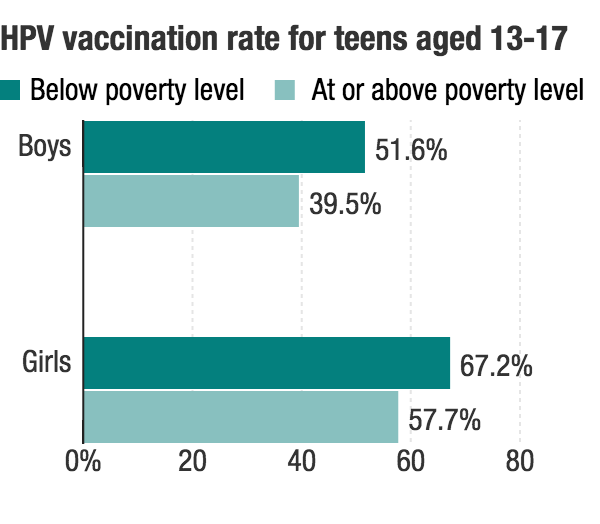 Among teenage girls ages 13 to 17 whose total family income was less than the federal poverty level for their family size, 67.2 percent have received the first dose of the human papillomavirus vaccine, compared to 57.7 percent for those at or above the poverty line. For teen boys, it's 51.6 percent compared to 39.5 percent. That's data released Thursday by the Centers for Disease Control and Prevention's 2014 National Immunization Survey for teens. There are multiple factors behind this trend, according to Dr. Anne Schuchat, director of CDC's National Center for Immunization and Respiratory Diseases. Differences in provider behavior might be one reason. Clinicians might not want to miss out on the opportunity to give poor children the vaccines that they need since they may not know when they'll next see the family. There's also the issue of cost. The federally funded Vaccines for Children program covers vaccines for uninsured or low-income teens, which means clinicians don't need to worry about billing and reimbursement at the moment of care. But the fact that teens from lower-income families are doing better does not mean that we as a country are doing a good job. Nationwide, four out of 10 adolescent girls and six out of 10 adolescent boys still have not started the three-dose HPV vaccine series recommended by the CDC for all kids who are 11 or 12 years old. The contrast is stark when you compare HPV vaccination rates with the two other recommended vaccines for teens. The rate is near 80 percent for meningococcal conjugate vaccine and well over 80 percent for the Tdap vaccine for whooping cough, the new numbers show. Vaccination isn't an easy sell for teens, as Shots previously reported, even when the most common vaccine protects against nine strains of human papillomavirus that account for 90 percent of cervical cancer in the U.S. Parents worrying that the vaccine promotes riskier sexual behavior in teens — it doesn't — might be one reason for the lack of coverage. There is still good news. The total number of teens getting HPV vaccinations increased slightly for the second year in a row. The number rose from 56.7 percent to 60 percent for girls, and 33.6 percent to 41.7 percent for boys. "This is a patchwork progress," Schuchat said at a media briefing on Thursday. "There's quite a range in HPV vaccination coverage around the country." Indeed, there's a 37.7 percent difference between the state with the highest rate of girls getting a first dose of HPV vaccine and the state with the lowest rate. That would be Rhode Island and Kansas, with 76 percent and 38.3 percent respectively. Four states (Illinois, Montana, North Carolina and Utah) and two areas (Chicago and the District of Columbia) averaged an increase of roughly 20 percent, with Washington, D.C., jumping from 55.6 percent in 2013 to 75.2 percent in 2014. The big changes are due to a combination of strategies in spreading awareness to the public, clinicians and families, Schuchat said. Teenagers were better at getting shots overall, with 87.6 percent getting at least one Tdap shot, which protects against whooping cough, compared to 84.7 percent in 2013. 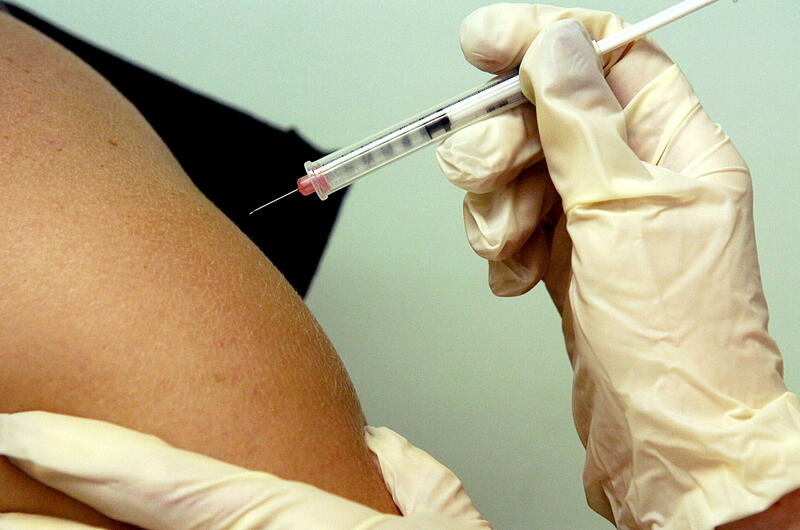 The rate for meningococcal vaccine rose from 76.6 percent to 79.3 percent. "[The data] show that it is possible to make real progress in different areas," says Schuchat. "It is possible to do much better."